Yep, That About Describes It! I’m in the middle of one of those whirlwind kind of weeks: today is my only (partial) day off and I’ll be working at Midwest Mania this weekend, just like last year*. 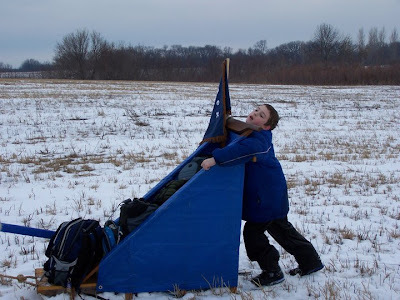 Jim and I were going through some old scouting pictures, and I think this picture of the younger boy on a winter camping weekend a few years back pretty much tells you all you’ll need to know about how I’ll be feeling by Sunday evening. How's the younger boy doing with all the attention? hope the week goes as smoothly as possible. And be sure to remind me of this photo if I EVER consider winter camping for my boys! Have a great time lady, but I hope you find time to rest too. You guys actually camp in the winter? Brrrr, I'm a-scared-a-yous!!! Seeing that picture gave me flashbacks to my boy scout days. Next post: Chicago’s Museum of Science and Industry Has a New Resident: Kate McGroarty! Previous post: McMels Gone Wild*!